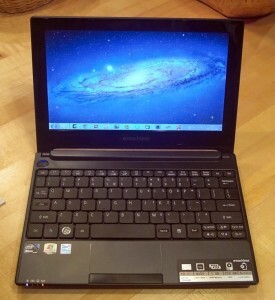 A Decent Netbook for Under $250? Who says you can't change the desktop background on Windows 7 Starter Edition? My first hands-on exposure to netbooks was a couple of years ago, when I was trying to find a small computer that we could place in our home entertainment cabinet to replace the turntable, tape deck, and CD player (we had already copied all of our purchased music into MP3 format). I checked out the usual suspects (Tohsiba, HP, Dell, Acer) at their usual hangouts (FutureShop, Circuit City, Best Buy), and everything I could find at that time was in the $500+ range. Then one day I was in the local Walmart to pick up something else, and saw they were selling eMachines netbooks for $248. A careful comparison of the machine with the pricier Acer next to it showed they were identical except for the logo, and the fact that the Acer came with Windows 7 while the eMachines had XP. They only had a few left, so I bought one on the spot, brought it home, installed Winamp, and set it up. It’s been doing its job superbly ever since. Fast-forward to November 2011. I travel to Europe about four or five times a year, generally for a week or less, and I like to travel light. That means only a knapsack and no other luggage. I unpack all my clothes and stuff when I arrive, and use the knapsack as a laptop bag. My laptop of choice had been a Toshiba Satellite U205. With a 12.1" screen and weighing 4.1lb., it was smaller and lighter than most laptops available at that time, but now I wanted something even smaller and lighter. Even the login screen background can be changed. I had done some research this time, specifically into the capabilities of Windows 7 Starter Edition and how well it would run in 1GB of memory. What I found was that the Starter Edition would run fine in 1GB, and was missing a big list of features that I never use anyway, except for one thing: it won’t let you change the desktop background image. Fortunately, it turns out that this is fairly easy to work around using either some registry hacks, or one of several excellent free third-party tools (that just do the registry hacks for you). I ended up using Starter Background Changer, which adds back the missing Personalize option on the desktop right-click menu. In addition to letting you change the background easily, it also gives handy access to sound, colour, and screen saver settings (instead of requiring you to go through the Control Panel for these). After using the machine for a few days, which included installing a full software development environment on it mirroring both my work and home computers, I decided I needed a few upgrades. 1GB worked fine, but I decided that 2GB would be better. It took a bit of sleuthing to find out exactly which memory module would work, after which I ordered the Crucial 2GB 204-PIN PC3-8500 SODIMM DDR3 module from Amazon. While I was at it, I also ordered a CaseLogic Netbook Bag to carry the machine in when I don’t want to haul around my knapsack. Upgrading the memory was a little involved. The older Acer and eMachines models had covers on the bottom that could be unscrewed. The new model has one large cover, but the screws that hold it in place are inside, under the keyboard. This necessitated removing the keyboard, which seems impossible at first, but is easy once you know how (hint: the rightmost four of the five tabs that hold the top edge of the keyboard are spring loaded). There are several videos on YouTube showing how to upgrade the memory. I did run into one snag, which was that after replacing the memory, the WiFi appeared not to work any more. After swapping the old memory back in, and then the new memory again, I discovered that there was simply a WiFi dead spot in the middle of my workbench. One thing that began to bug me about the machine was the keyboard. Like the eMachines netbook in our entertainment centre, the eM355 came with a Canadian Multilingual keyboard, designed to be equally bad for English and French. It has not one, but two backslash keys, both of which are in the wrong place! Computer manufacturers are required to provide both English and French keyboards for sale in Canada, and it seems that many laptop manufacturers decide to just produce a single combined keyboard. I quickly discovered that Acer OEM keyboards were readily available through sellers on eBay at prices ranging from $15 to $40. I found a seller that was reasonably close by (Ottawa) and ordered a US layout replacement keyboard. The original keyboard with it's annoying multi-lingual layout. Since I’d already had the keyboard out three times before, replacing it was not a big deal. I found that it helped to pre-bend the ribbon cable to match the old keyboard before attempting to click the new one in place. I thought I might have to remap some keys after installation, but all the keys worked as intended with no effort on my part. The replacement US-layout keyboard after I installed it. I remapped the Caps Lock key, and the right-hand Alt and Ctrl keys. I did remap some keys to make the keyboard a little easier to use. Like many laptops, this one has the Home and End functions shared with the PgUp and PgDn keys, activated by pressing a special Fn key. Using the free SharpKeys utility, I remapped the right hand Alt and Ctrl keys to become Home and End respectively. While I was at it, I mapped Caps Lock to be a Ctrl key as well, since that is where the Ctrl key is supposed to be on a computer keyboard (and is much more comfortable to use). I used my wife’s Brother label printer to make new key-top labels for these keys. One other tweak I made was to install Classic Shell, which adds back the classic Start Menu that Microsoft so rudely removed from Windows 7. This is handy for those of us who like to organize things into folders on the Start Menu instead of letting Windoze rearrange things willy-nilly. It also adds a few features to Windows Explorer to make it a bit easier (i.e. more XP-like) to use. All of the individual features can be configured (or disabled entirely) as desired. It’s amazing how cheaply you can get a decent computer these days. 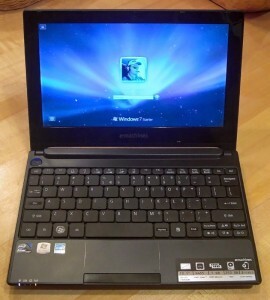 My Toshiba U205 was about $1400 when I purchased it a few years back. Now for about $200, one can buy a machine that is smaller, lighter, and almost as fast. Add $46 worth of upgrades ($13 for the RAM, $33 for the keyboard), plus some free third-party utilities, and you have a pretty decent go-anywhere machine, still under $250. Acer owns eMachines and Gateway. And most notebooks and netbooks are actually made by a handful of companies called ODMs, many of whose names are not known to the public. Win7 Starter limits the amount of memory that can be used to 2G http://msdn.microsoft.com/en-us/library/windows/desktop/aa366778%28v=vs.85%29.aspx . Otherwise 4G would be a natural choice (works fine in Linux). Netbooks seem to be falling out of favour. Eclipsed by tablets? ODMs? Isn’t it OEMs? Yes, it’s true that Win7 starter limits you to 2GB, but that’s plenty for pretty much anything you’d want to do on a little machine like (Adobe Premiere Elements works fine on it, but it’s a pain to edit videos on such a small screen). Yes, tablets do seem to have replaced netbooks, which is a shame, since you can’t do half the things on a tablet that you can do on a netbook. Perhaps the advent of Windows 8 tablets will change that. But netbooks, with their screens protected by the keyboard when closed, are much more robust than tablets IMO.